Your library most likely already has a GMB page, whether you know it or not. As part of a website redesign process, our library web team conducted usability testing in which patrons were observed navigating our new site design on a mobile device. By observing user behavior and looking at Google Analytics data, we soon realized that many users on mobile devices preferred to connect to and interact with the library site’s content through Google and/or their device browser, rather than navigating to and gathering information on our site itself. In other words, they wanted to Google our hours and see them right away as a Google search result, not navigate to our website URL, find our Hours page, and read the information there. This observation led us to develop a new SEO strategy and to redefine the boundaries of the library web presence, particularly with the mobile user in mind. 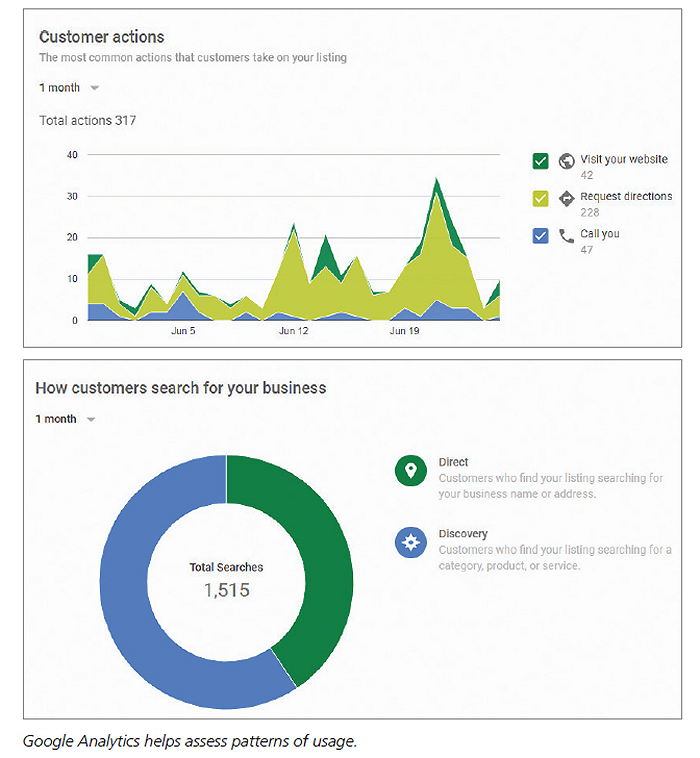 We undertook a process of claiming our Google My Business (GMB) page and adding information such as photos, hours, keywords, and other metadata. We immediately noticed improvements in users finding the information they sought, such as a reduction in calls to our help desk asking for basic building information. In addition to being able to better reach users where they are, our GMB page gives us control over content in a way that is not possible on our own website, given institutional politics. In this article, we will help librarians and library staffers understand the value of having a GMB page for a library. We’ll also go over the process of creating one. Why Take Control of Your GMB Page? The primary reason to control your GMB is to make sure your institution’s information is accurate and is seen quickly by patrons. A common search conducted by a mobile user is aimed at getting directions, hours, and phone numbers for a business. With GMB, these options display as interactive buttons on the results list on a mobile phone, and any next steps (such as calling a phone number) can be done with a one-finger tap. Information and keywords added into GMB are by default optimized and incorporated into Google’s Knowledge Graph along with other linked data-ready information. Additionally, many resear­chers begin their research in Google, and increasing a library presence there can serve as a bridge to the library site and its content (Wolff-Eisenberg, et al., 2016). Since Google Analytics data indicates that more than 11% of our patrons are finding us through a search engine rather than via a direct URL or referral from another site, it’s important to work with the tools the search engine offers us to better connect those individuals with our content. That 11%, by the way, doesn’t account for the people who gather information on Google Maps and never hit our site. Your library most likely already has a GMB page, whether you know it or not. GMB is a free listing service, created by Google in 2014, that makes it easier for users to find businesses and other organizations on Google via Google Search and Google Maps. GMB incorporated some of what had been previously branded as Google Places for Business, Google Local, and Google+ Business Pages. Google created many business pages from publicly available listings, and people can also create and edit listings (and are rewarded for doing so through the Google Local Guides program). One of the first times Metropolitan State University Library became aware of GMB was due to incorrect information on the unclaimed Google Business page for Dayton’s Bluff Public Library, a branch of the St. Paul Public Library that shares a building with our academic library. Whether by user-submitted error or a Google-created mix-up, our university reference desk phone number was listed as the main phone number for the public library, which meant we were suddenly getting lots of calls about children’s storytime and how to renew items not held in our catalog. Once we determined that the erroneous information was coming from a GMB page, we were driven to learn more about the service and claim our own page in 2015. This incident further underscored the fact that SEO and correct metadata translate into a findable library web presence. It also reinforced the idea that there is a lot more to consider regarding your library’s web presence than your official webpage. In short, it is in the best interest of a library to think broadly when assessing web usability. As noted previously, a GMB page probably already exists for your library. But to counteract the potential for bad data about your institution being displayed and to take ownership of your web presence, we recommend claiming ownership of the page and verifying the information in the listing. The process to claim an already extant GMB page is fairly straightforward. 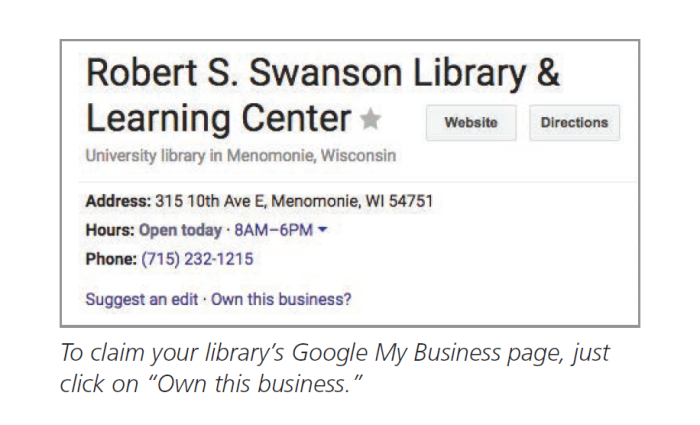 Find your library on Google Maps and see if the listing says, “Own this business?” That means it is an unclaimed page (see the example above). Click the link and follow the steps to claim it. You will need to verify that you are authorized to claim the page by either having a postcard mailed to your business or having a robocall from Google to the listed number. In our case, we used the phone number verification option. Your listing will become tied to a GMB account, which is then tied to a Google login. We recommend using an institutional Google login to serve as the primary account owner, and then adding as many people you want from your institution as managers. That way, account accessibility is not linked to or dependent on one person. Your library may not have a separate GMB page from your parent institution—especially if you are a small library attached to a college or similar institution. The college may have a page, but not the library. In this case, you can also decide to create a new business listing by simply dropping it into a map using the “Add a missing place” feature of Google Maps or by creating a GMB account and manually adding your business by submitting an address and other information. If you are at a very large institution with multiple library branches or locations, there may be multiple pages out there that can be claimed and merged under one GMB page. Once you have access to your library’s account, all edits to the page are initially done through the “manage location” link and the dashboard. Information that administrators can add or edit includes the library hours, a description of your library, metadata, map pin/location of your library, URL, phone number, organizational type, and photographs. You can also manage and respond to user-submitted information and reviews. The ability to add photographs allows a library to highlight its unique aspects as well as tailor its visual message. For instance, our library has an outdoor labyrinth, and we included pictures of it. Keeping information, such as hours, up-to-date means having another place to monitor, so someone in the library will need to be accountable for this task. However, scheduling is very easy, and you can schedule hours, including holidays and closures, up to a year in advance. In general, the more information you add to your GMB listing, the better. GMB has built-in analytics that can be accessed directly through the account and in summary as a monthly email performance report. The monthly report contains the total number of people who viewed Google Search and/or Google Maps, clicked for directions to the library, and found the library’s phone number and called it. From our May 2017 report, we can see that more than 4,600 people found our information through Google Search and Google Maps combined, while 288 people clicked to retrieve directions. The usage statistics accessed directly through Insights are more detailed and include comparisons of where patrons are viewing your GMB page, whether it’s Google Search versus Google Maps, if patrons search for your library by name or use a category (such as library) to find you, when and how many times patrons are calling you, and the most common actions that patrons take when engaging with your library’s listing. It can also provide a broad overview of how many views your listing has had and the total number of actions patrons performed over a weekly, monthly, or quarterly period. For example, for a recent month, we can see that close to 60% of the searches for our library were by discovery rather than a direct search. Analytics have become increasingly important at our library as we strive to understand how our patrons are searching and accessing information via our website and affiliated resources. We have come to realize that sometimes the best sources of data reside outside of our institutional walls, and often, these outside resources give us more control over our web content than our own institution does. From the data, we can also see that our Google presence does drive traffic to our institutional website as well. Our library considers the mobile capability of GMB to be one of the most beneficial aspects. It allows our patrons to interact with us in a way that meets them at their point of need. From the administrator side, there is a mobile app that has many of the same functions as the desktop version. The mobile app also provides accessibility support for blind and low-vision users. Through our usability studies and analysis of Google Analytics, we realized that a growing number of our patrons are accessing our website through a mobile phone or tablet. For example, the statistics in our Google Analytics for a 90-day period show that the combined sessions for mobile phone and tablet have been 8.5%. The process of claiming or creating a GMB page for a library is relatively simple, and the potential benefits derived from having easily accessible, up-to-date information about your library on the web cannot be stressed enough. The initial low investment time that this service required has been paid back in greater dividends to our patrons by taking into consideration their information needs and wants. Having a GMB page makes it easier for users to connect with your library by making your information easier to find on Google Search and Google Maps, places they are increasingly starting their searches from. Lastly, inserting your library into these spaces offers you a way to control your presence there, to collect analytics, and to reach your audience in a mobile-friendly, linked data-forward way. Wolff-Eisenberg, C., Rod, A., and Schonfeld, R. (2016, April). “Ithaka S+R US Faculty Survey 2015.” Retrieved April 29, 2016, from sr.ithaka.org/publications/ithaka-sr-us-faculty-survey-2015. Becca Peters [left] (becca.peters@metrostate.edu) is an assistant professor and cataloging and acquisitions librarian at Metropolitan State University Library in St. Paul, Minn. Her interests include Google Analytics, metadata, and linked data. Jennifer DeJonghe [right] (jennifer.dejonghe@metrostate.edu) is a professor and reference and instruction librarian at Metropolitan State University Library in St. Paul, Minn. Her interests include user experience, SEO, and gaming.